Since the previous Clinical Tips were about the Swollen tongue and Phlegm, the use of acupuncture to resolve Dampness and Phlegm and the use of ST-40 to resolve Phlegm, I would like to stay with the subject of fluids pathology and discuss the use of the point BL-22 Sanjiaoshu. I have mentioned this point in a previous entry as one of the points to resolve Dampness and/or Phlegm. BL-22 is called Sanjiaoshu, i.e. “Shu [point] of the San Jiao” and it is obviously situated just above BL-23 Shenshu, the Back-Shu point of the Kidneys: as we shall see below, this is very significant.Given that the Triple Burner is an Arm channel, i.e. Arm Shao Yang, and therefore a channel of the upper limbs, why should the Back-Shu point of the Triple Burner be in the lower back near the kidneys and not in the upper back? The book “An Explanation of Acupuncture Points” (1654) has a very interesting observation. It says that the Pericardium (Arm Jue Yin) has a Back-Shu point at BL-14 Jueyinshu (in the upper back) and the Triple Burner has a Back-Shu point at BL-22 Sanjiaoshu. Notice how the Pericardium has a Back-Shu point in the upper back (not by chance just above the Heart Back-Shu point BL-15 Xinshu) and the Triple Burner has its Back-Shu point at BL-22 Sanjiaoshu in the lower back, just above the Kidney’s Back-Shu point BL-23 Shenshu (Fig. 1). “Logically” as the Triple Burner channels is associated with the Pericardium channel, the Triple Burner’s Back-Shu point should be in the upper back also because the Triple Burner is an Arm channel (Arm Shao Yang). We shall soon see why it is in the lower back, just above the Kidney’s Back-Shu point. 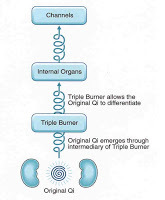 To explain why the Triple Burner Back-Shu point is next to the Kidney’s we need to explore the nature of the Triple Burner. The Triple Burner’s nature has occupied Chinese doctors for centuries and there are different views of it; as usual in Chinese medicine, different view are contrasting but not necessarily mutually-exclusive ones. For centuries, Chinese doctors have been discussing whether the Triple Burner “has a form” (you xing) or not. The Chinese expression “has a form” means that the Triple Burner is an actual Fu organ; if the Triple Burner “has no form”, then it is not like the other Fu but just a complex of functions “without form”. Both these views are correct! Chapter 38 of the Nan Jing has the famous statement that the Triple Burner “you ming er wu you xing“, i.e. it “has a name but not a form”. The Chinese expression is very elegant in that it contrasts you (it has) with wu you (has no, it does not have) and also rhymes ming (name) with xing (form). 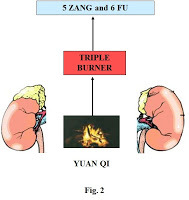 Therefore according to the Nan Jing, the Triple Burner has no physical entity like the other Fu organs but it is a set of functions.What are the main functions of the Triple Burner in the Nan Jing? Chapter 8 discusses the function of the Triple Burner: “This Yuan Qi is the root of the 12 channels, it is the Motive Force (Dong Qi 动 气) between the Kidneys, the root of the 5 Zang and 6 Fu and of the 12 channels, the gate of breathing and the origin of the Triple Burner. Figure 2 illustrates this passage. This is a very important statement that links the Triple Burner not only with the Yuan Qi but also with the Ming Men which is called also the “Minister Fire”. It may be because of this that the Triple Burner is said to belong to the “Minister Fire”. The Minister Fire is the physiological Fire of the Kidneys that is essential to all the Zangfu and all physiological processes. It is in the Kidneys but it comes out of the Kidneys through the intermediary of the Triple Burner and that is why the Triple Burner’s Back-Shu point is not by chance above BL-23 Shenshu, the Back-Shu point of the Kidneys (Fig. 3). Notice that I have two different translations of a crucial few words above, i.e. either “the Triple Burner is the envoy of the Yuan Qi” or “it allows the Yuan Qi to separate into its different functions”. This second translation was proposed by Steve Clavey and it is one that has great merit. This interpretation means that the Triple Burner allows the Yuan Qi to separate into its different forms in different parts of the body to perform is various functions. The places where the Qi of the Yuan Qi “comes to a halt” are the Yuan points on each channel.There is another interesting significant symmetry in the location of points and that is the one between BL-22 Sanjiaoshu and Ren-5 Shimen. BL-22 is the Back-Shu point of the Triple Burner and is above BL-23 Shenshu (Kidney’s Back-Shu); Ren-5 is the Front-Mu point of the Triple Burner and is above Ren-4 Guanyuan (a point closely related to the Kidneys). Note that Ren-5 also tonifies the Yuan Qi.Thus, the location of BL-22 just above BL-23 and of Ren-5 just above Ren-4 (a point that tonifies the Kidneys and is related to Jing) confirms the above view of the Triple Burner as the agent allowing the Original Qi to emerge from between the Kidneys and be activated all over the body to perform its various functions. In practice, I often do use both these points (BL-22 and Ren-5) to stimulate the Triple Burner’s metabolism of fluids.But going back to the point BL-22 what are its functions? I had the rather lengthy introduction above because some of its functions are related to the Triple Burner’s being the “envoy” of the Yuan Qi. We could also call it the “agent” of the Yuan Qi.The ancient book “An Explanation of the Acupuncture Points” mentioned above breaks down the actions of the point BL-22 according to Upper, Middle and Lower Burner. – Upper Burner: headache from invasion of Wind-Cold, vomiting and rebellious Qi with digestive symptoms and dizziness. – Middle Burner: (substantial) masses of the internal organs, a feeling of distension and fullness with emaciation, no appetite, shoulder pain, backache with rigidity. – Lower Burner: turbidity, diarrhoea, abdominal distension, borborygmi. Modern books lists more symptoms and these can be found in Deadman and Al Khafaji’s “Manual of Acupuncture” (p. 282) and my own “The Channels of Acupuncture” (p. 984-5). Among the indications, modern books mention also the Shao Yang Syndrome, i.e. alternation of chills and fever, bitter taste, dry throat, etc. From what I can see the old texts do not mention these indications under BL-22; for example, the Compendium of Acupuncture (Zhen Jiu Da Cheng) and the ABC of Acupuncture (Jia Yi Jing) do not mention it. I suspect this is a modern addition inspired by BL-22 being the Back-Shu point of the Triple Burner. However, and this is an important point, the “Triple Burner” that is the “agent” of the Yuan Qi and the Triple Burner as Water passages have nothing to do with the Triple Burner as the Shao Yang channel! In other words, there is an apparent dichotomy between the Triple Burner as the agent of the Yuan Qi and the Triple Burner as the Shao Yang channel. Thus, to treat the Shao Yang Syndrome I would definitely use points from Triple Burner channel and particularly T.B.-5 Waiguan and not BL-22.Modern books list also oedema, difficult urination, turbid urine, blood in the urine and these indications are indeed also in the old texts. I personally use this point almost exclusively for the Lower Burner and especially to promote the transformation, transportation and excretion of fluids in the Lower Burner, hence the symptoms of oedema, difficult urination and turbid urine. I use this point in all cases of Dampness or Phlegm in the Lower Burner in combinations that I posted on an earlier blog and a previous Clinical Tip. But another reason why this point would act on the fluids of the Lower Burner is to do with its function with regard to the Minister Fire of the Kidneys. Just like it is the “envoy” of the Yuan Qi, it is also the envoy of the Minister Fire. The Minister Fire heats the fluids in the Lower Burner and this (physiological) heat is essential to the transformation, transportation and excretion of fluids.Thus, the point BL-22 acts on the fluids metabolism in the Lower Burner for two reasons. Firstly, the point transforms fluids and therefore resolves Dampness because the Triple Burner is a system of waterways for the transformation, transportation and excretion of fluids. The famous chapter 8 that compares the Zangfu to “officials” says that the Triple Burner is the official in charge “of irrigation and controls the Water passages”. Secondly, the point transforms fluids through its activation of the Yuan Qi and of the Minister Fire. Thus, as the Triple Burner’s Back-Shu point is on the Bladder channel, there is a connection between these two channels. 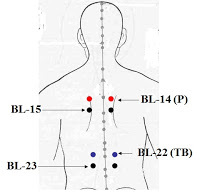 Interestingly, there is another connection between the Triple Burner and the Bladder channels that is highlighted in the “ABC of Acupuncture” (Jia Yi Jing) by Huang Fu Mi. This connection occurs via the point BL-39 Weiyang which is the Lower He point of the Triple Burner. The He points of the Triple Burner, Small Intestine and Large Intestines (all Arm channels) are T.B.-10 Tianjing, S.I.-8 and L.I.-11 Quchi respectively. However, since the organs of these three channels are located in the Lower Burner, these three channels also have three so-called “Lower He” points which are BL-39 Weiyang for the Triple Burner, ST-37 Shangjuxu for the Large Intestine and ST-39 Xiajuxu for the Small Intestine. The “ABC of Acupuncture” says that the point BL-39 Weiyang, Lower He point of the Triple Burner, is used for abdominal distension and pain with retention of urine. The text specifically says that this is a “Triple Burner disease” and this confirms the nature of the Triple Burner as a system of waterways for the transformation, transportation and excretion of fluids. 1) It is a system of waterways that transport and excrete fluids. 2) It is the “envoy” of the Yuan Qi and Minister Fire. 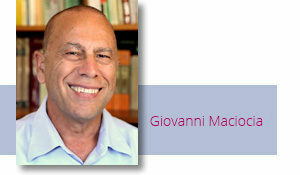 3) It is a system of “cavities” (not discussed here). 4) It is a Shao Yang channel that treats mostly problems of the Shao Yang area in the shoulder and head (especially ears) and also the Shao Yang Syndrome from the Shang Han Lun.